The correct (heheh…) spelling of the word “neighbourhood” indicates that this raucous bunch hail from the UK. They formed 10 or so years ago as student band and quickly established a name for themselves on the European jazz circuit. Since their debut album Arboretum in 2005, the band have garnered numerous awards and acclaim including a coveted Mercury Prize nomination for 2009’s Sensible Shoes album. 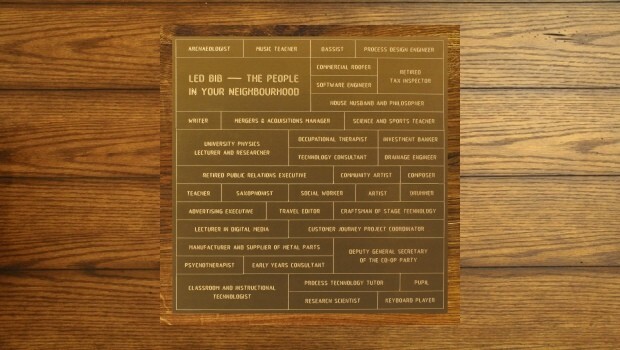 The People In Your Neighbourhood is the group’s fifth studio album and was funded by a Kickstarter campaign, the occupations of the fans/donators forming the artwork on the front cover. This is the group’s sixth release overall; there is also the Led Bib Live EP in 2008. Playing a stew of instrumental punk-space-jazz-rock, opening track New Teles (no idea what that means – did they mean “telly” as in TV? Probably not) storms out of the farmyard like a bull on heat. It reminds me of Pigbag, as it has that same mad joie de vivre, and it is undoubtedly the most atypical and commercial sounding track on the record. It is no coincidence that the rhythm section is listed first in the credits on the cover, for rhythm is central to this band’s ethos. The musical colour is offered by the twin alto saxes and the keyboards, mostly piano. A slower track like Angry Waters (Lost To Sea) gives this top line a chance to shine as the drums and bass remain relatively restrained albeit still playing a central role. The initial rhythm track on this sounds like a drum stick being bounced on an echoed bass string and looped, testimony to the band’s experimental instincts. The alto saxes weave through a gorgeous melody line that builds to an entwined crescendo, after the tune has settled with a relatively conventional chord progression on the piano. A fine example of their more avant inclinations is Recycling Saga. As with their other more expansive tunes on the album, the more angular elements of their avant muse are always kept in check by a darn good tune, and that punchy rhythm section. Led Bib remind us of their playful nature on the following mariachi-funk stomper Plastic Lighthouse, a tune that would sound just right being belted out from the back of a flat bed truck in a carnival procession. More examples of the extrovert nature of Led Bib follow on Tastes So Central, which offers more reverbed electronica, this time via an electric piano as one of the saxes does a passable impersonation of a wistful trumpet solo. Becoming quite dreamy and meditative, the rhythm section takes a well earned rest during this extended middle section of the tune. At The Ant Farm is a return to Pigbag, but played by Gentle Giant. Mad as a box frogs, replete with synth squiggles, it eventually runs out of gas and floats becalmed in space, just out of reach of gravity’s pull before slowly casting off with another of those languorous and bluesy sax solos. Great stuff! This album will delight fans of jazz rock, in the pre-fusion sense, and anyone who likes a catchy tune belted out with gusto.